Gray t-shirt. 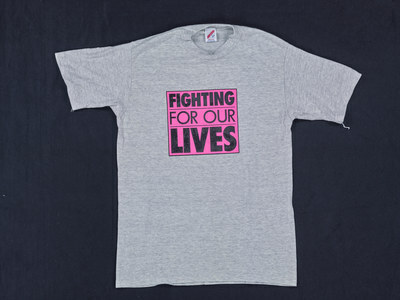 Text: [Front] "FIGHTING FOR OUR LIVES" [Back] "PWA People with AIDS Coalition"
People With AIDS Coalition, ""FIGHTING FOR OUR LIVES"" (2016). T-Shirts. 228.